DMEB-2: Features including interviews, articles and pictures from DMEB2 gatherings! Welcome to the Features Section of DMEB-2: Here we will showcase various items of interest to our community. The DMEB-2 has another "Official Maul" to add to our collection! Meet DarkSiderSteve (SL-9167 of the Dune Sea Garrison) in our exclusive interview. We also have a number of pictures to share with more promised in the future! Artist Erik Barclay (best known here for his Maulvels Comic Series and Fan-Art ) has created a unique tutorial for creating your own customized Darth Maul figure... hosted by Mr. Maul! This you gotta see to believe! 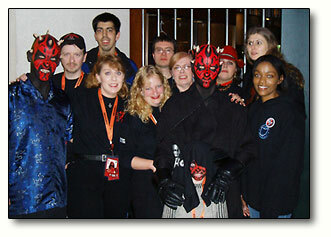 MaulsMate is proud to present Empire FanFest 2004. Special Guest Mark Hamill (Luke Skywalker) highlights the weekend convention. Other Star Wars guests include Michael Sheard (Admiral Ozzel) and Comic Artist Jan Duursema (of the Darth Maul Comic Series fame). DMEB-2 exclusive. Will Brooker, author of 'Using The Force', has given DMEB-2 an exclusive preview of the latest paperback edition. 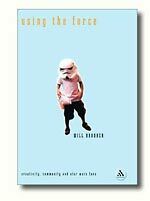 The book is excellent, and is a true celebration of Star Wars fans, including those female fans such as ourselves, who write fanfiction. 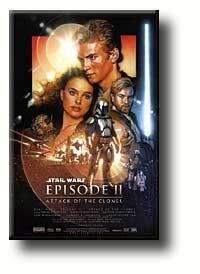 For this special edition, printed after Will saw Attack Of The Clones, he gives his views and comments on Episode II, in an Epilogue entitled 'Post Bellum'. Read his exclusive piece written especially for DMEB-2 in April 2003. Read our review of the hardback issue Using The Force and get another taste of the extra chapter. 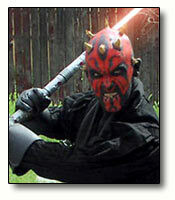 Meet the Official Darth Maul of DMEB-2! DMEB-2 is proud to announce our Official Darth Maul with the position being filled by ScottMaul! 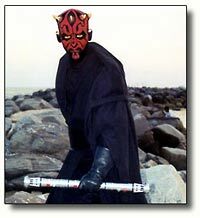 Included in our feature, we have an Interview, and a page entitled "To Make a Sith..." in which he gives the details on making his costume and finally a page with some great pictures of ScottMaul, including some from Dragon*Con 2001. It seems ScottMaul has friends in High Places! His picture - from the Celebration 2 DMEB-2 Dinner has made it to the Photo Caption of the Week at StarWars.com! 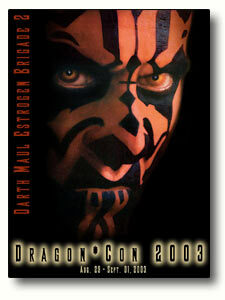 A short interview to update everyone on ScottMaul and what he plans for Dragon*Con 2002. In addition, MaulMaus wrote into SW Insider Magazine and included a picture of ScottMaul with the original Maul... Ray Park! See the letter here! saphsaq, Belle and Dark Lady review Episode II: Attack Of The Clones, which Dark Lady saw on its first day of release, in Sheffield, UK. Storyline, costumes and special effects are discussed along with the movie's high and low points. The one point she wants to make perfectly clear is that Episode II would have been better with Darth Maul in it! Something we here can all agree on! DarkLady gives a first review (From Region 2 UK Version) of the new The Phantom Menace on DVD including the cut-scenes from the original movie and the featurettes, focusing on the Fights section with Ray Park. Cynthia Griffith Interview: DMEB-2 interview's artist Cynthia Griffith about her art. She talks about her influences and why she loves to draw Darth Maul as well as some of her future plans. 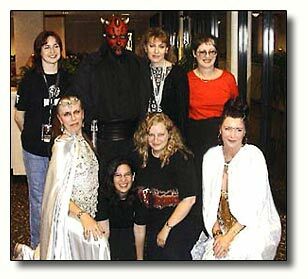 Star Wars Celebration III from April 21-24, 2005 was another fantastic time for many members of the Darth Maul Estrogen Brigade. Not only did we have the opportunity to meet our online friends again, but also our "Official Darth Maul" and two new Maul's, DarkSiderSteve and Bad Jango. In addition, the MAN himself, Ray Park appeared at SWC3. Not bad for a long weekend! Belle, Bad Jango (and son! ), Sith Duck and Shades! Members of DMEB-2 attended Dragon*Con 2003, held over Labor Day weekend in Atlanta. Again, we all had a wonderful time seeing old friends and meeting new ones! DarkLady surprised many of us by showing up for the big event! Again our Annual DMEB-2 Dinner was a big success, thanks to everyone who attended! Members of DMEB-2 attended Dragon*Con 2002, held over Labor Day weekend in Atlanta. We had a terrific time seeing old friends and meeting new ones! Everyone has been generous in sharing their pictures of yet another unforgettable event! The Darth Maul Estrogen Brigade has made it to its First Birthday!!! (June 17, 2002). We have a couple pages to celebrate the occasion! 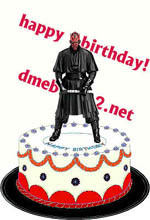 First, a Birthday Page and also some Special Darth Maul Pictures and a discussion of how Darth Maul has been drawn by some various artists. 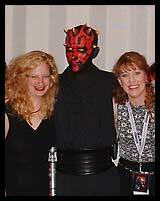 Star Wars Celebration II from May 3-5, 2002 was a highlight in the memories of many members of the Darth Maul Estrogen Brigade. Not only did we have the opportunity to meet our "Official Darth Maul" we also finally got to meet one another face to face, some for the first time! It was an experience none of us attending will ever forget! We have several pages in this section - Summaries to each day's events, reflections by our members as well as a large image gallery.